You have a snowball's chance of resisting this addictive iPhone game. Winter's almost over, but that doesn't mean we can't enjoy the snow. MegaNudge's cute 2-D iPhone game, Snowball Runner, puts you in control of a runaway snowball. By tilting the iPhone left and right, you're able to control it and snag items while avoiding obstacles. While not the most technically impressive video game, its online leader board has us hopelessly addicted. Each time you play, the snowball begins at the top of the screen and rolls towards the bottom. As you tilt back and forth, the snowball grows bigger. Run over animals, presents, elves, Santa Claus and other goodies (you can even fly off ramps to hit airplanes) and you'll earn points. 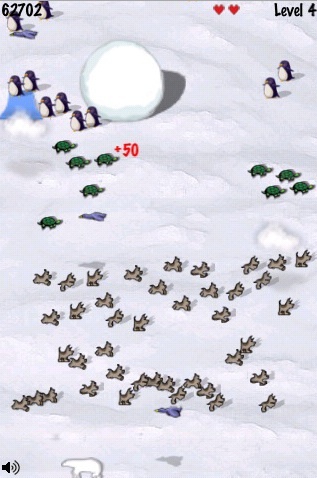 Smash into houses, rocks and trees and your snowball decreases in size. Land in a puddle of water and it's game over. Snowball Runner features simplistic and cute graphics. Animals make their way across the playfield, jets soar through the sky and a steaming locomotive chugs along the train tracks. Meanwhile, the excellent controls let you skillfully dodge objects while picking up goodies that boost your score and make the snowball temporarily invincible. What really makes this game sweet is the online leader board. After losing all three lives, you can upload your score and check out the global rankings to see how well (or awful) you've done. It's what ultimately separates Snowball Runner from the competition. Sure, it lacks 3-D visuals and other bells and whistles, but we're always up for a game of Snowball Runner and we suggest you download it immediately. Good luck beating us. What's Hot: Cute 2-D graphics, excellent tilt controls, online leader board, you can run over Santa Claus, costs .99.